Vitamin World is one of the leading manufacturers of vitamins and nutritional supplements distributed in retail stores across the United States. The company is actually a subsidiary of NBTY Inc. NBTY manufactures and sells its products under the Vitamin World, Holland and Barett, and Puritans Pride labels. Vitamin World is the name of the North American retail stores, while in the UK it's Holland and Barrett, and Puritans Pride is the online/catalog phone ordering division. Arthur Rudolph founded the company in 1960 and it's still headquartered in Bohemia, New York. With the slogan being “Nutrition starts at the source”, they believe in delivering the best nutrition the world has to offer by searching the earth for the best and most unique ingredients, which is a process they take very seriously. Vitamin World guarantees that every product is rigorously tested and meets their high expectations, once happy with the source of ingredients; they cultivate them and bring them to the manufacturing facilities where supplements are created and produced. Today the company has over 440 retail locations and also sells its products online at VitaminWorld.com. Here they are always running special offers and deals which you can redeem with Vitamin World coupons. Here at Coupofy we list all of the latest codes, so you're sure to make savings whenever you decide to order. Vitamin World offers its customers a wide variety of nutritional products including vitamins and minerals, supplements, herbs, sports nutrition, diet and lifestyle products, health and beauty products, men’s and women’s products and much more. Vitamin World products are found in over 400 store locations nationwide and their online store gives you an option to search with an A-Z product shopping method, making it user friendly and easy to find the product you need. Best sellers include Multivitamins, Vitamin D, Omega 3 Fish Oil, Probiotics, and Whey Protein. Popular brands stocked by Vitamin World include their own in-house brand, as well as Country Life, Dr. Woods, Inner Armour, Maty's, Panda, Pure IGF, and hundreds of others. There are 3 methods of placing an order through Vitaminworld.com. You can order online by going to the site and placing an order,order by phone and by calling the toll free number 24 hours a day, 7 days a week. The company accepts the following payment methods: Visa, MasterCard, Discover, American Express, JCB, PayPal, Checks and money orders. To redeem a Vitamin World coupon code, simply enter it in to the promo box ahead of payment. Once applied you should see the total order price drop. Vitamin World offers free shipping for domestic shipments on purchases of $75 or more. You can sometimes get this totally free by using special Vitamin World coupons. 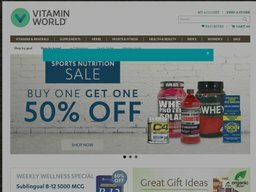 If not, for orders under $75, vitaminworld.com will ship for only $1.95 and you can also chose to have your order shipped via USPS for only $1.95 as well, allowing 3-8 business days depending on destination of delivery. International shipments will be charged postage costs depending on weight and destination, and an additional charge of $1.95 with free shipping not applying to international orders. When it comes to returning a product, Vitamin World has a customer satisfaction guarantee and each product can be returned within 90 days of purchase along with the unused portion of the product and a short explanation. Once received, the company will refund its customers for the unused portion.